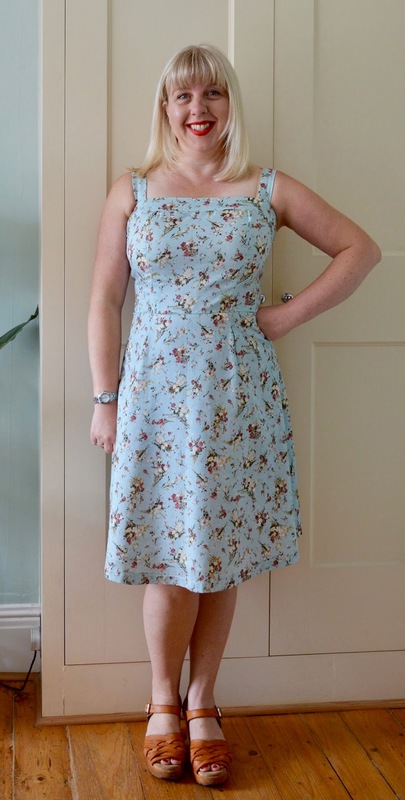 Way back in 2013 I made myself a strappy sundress using Simplicity 2176. During its short life it was a great success, it was made with lovely fabric and had a cool vintage vibe. Sadly it came a cropper in the washing machine when the blue dye from the main dress seeped into the white bodice band, leaving it an unsightly shade of dishwater grey. I know, I know, I probably could have saved it by unpicking the bodice band and adding a new one, but as we all know I'm totally lazy and that was never going to happen. The dress was donated to charity and I was left one sundress short in my summer wardrobe. This year, I finally got round to sewing a replacement. I did a bit of tinkering with the bodice for this second version. 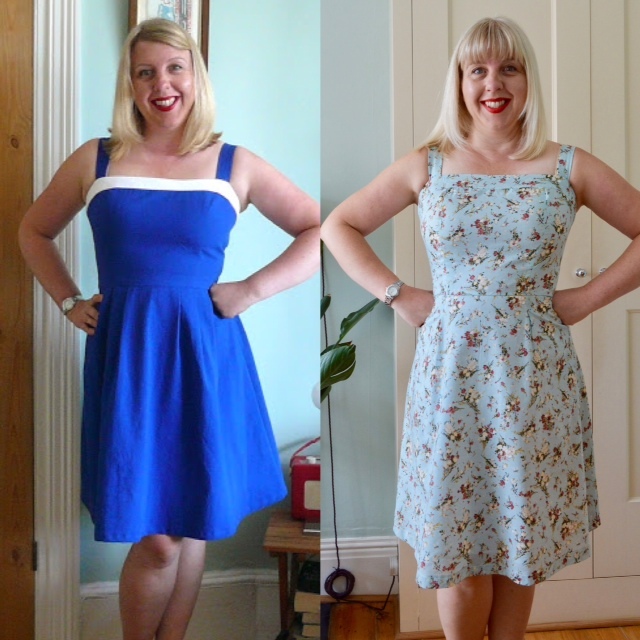 The fit on the bust on my original dress was always quite tight, which made the waistline ride up as a consequence. This time I added a one inch full bust adjustment (FBA) and lengthened the bodice by 5/8". I also added a little extra to the side seams as I find very tight waists unbearable in hot weather. Overall I think the fit on the bodice is much better - it's not actually that noticeable but I feel the benefit! The skirt is from New Look 6557, the same one I used for my Fireworks dress. I love this shape of skirt (a quarter circle) in the hot weather as it's cool and airy without being too big. The only other change I made was to substitute the lapped zip for an invisible one and attach the inside bodice band to the zip by machine for a neat finish. 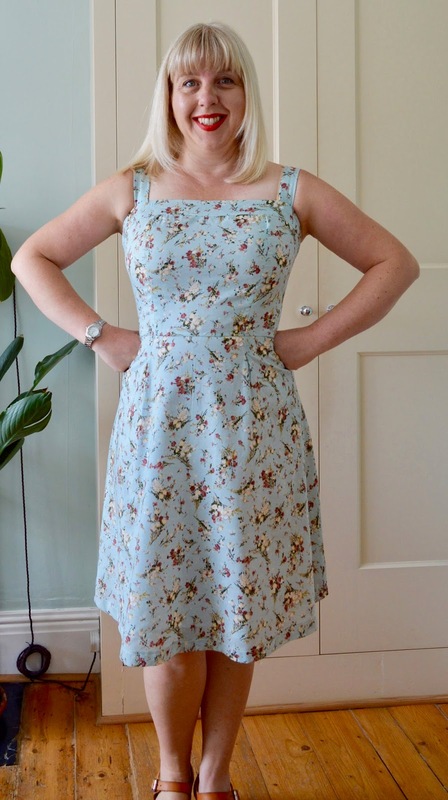 The duck egg blue fabric is a lovely lightweight floral lawn that I leapt on when Freya was de-stashing at a recent meet up. There was 2m to play with, which was just enough for this dress, thanks Freya! The colour is slightly brighter in real life, more like the photo below. Spot the felt tip marks that still need to be washed out! Because the fabric is very light I underlined the bodice sections and cut a separate skirt lining with white silk cotton. I probably should have added a full lining to the bodice instead of underlining it as this would have concealed the notched princess seams. I also added strips of interfacing either side of the invisible zip for extra support and stay tape across the top of the bodice to prevent it stretching. What a nice dress you made for yourself. You should be proud of yourself! The dress looks lovely. I guess we have you to thank for this foul weather! It's lovely! It looks perfect for summer. 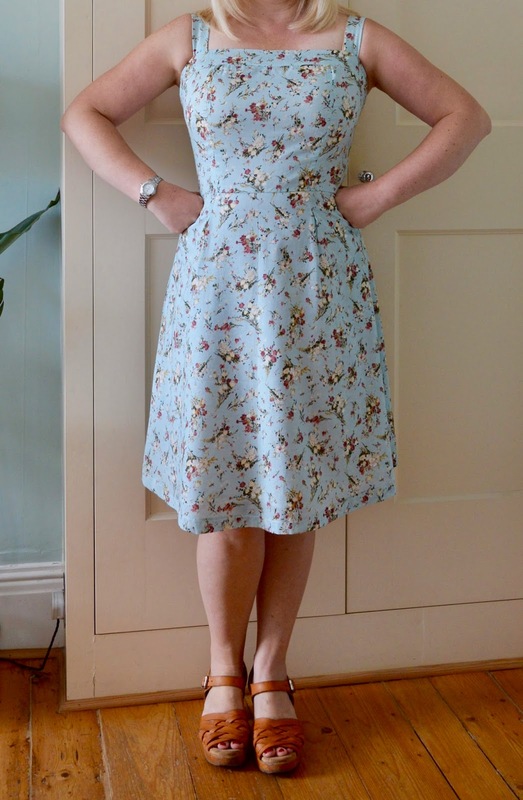 Super lovely dress, Jane - perfect for the current weather!!! Very pretty, hope you can wear it without a cardigan soon! Pretty dress! I love the color, looks great on you. I'll trade you weather, it's 104 degrees today in Washington State. I need a pool. I cant wait for fall, my favorite season. This is lovely! 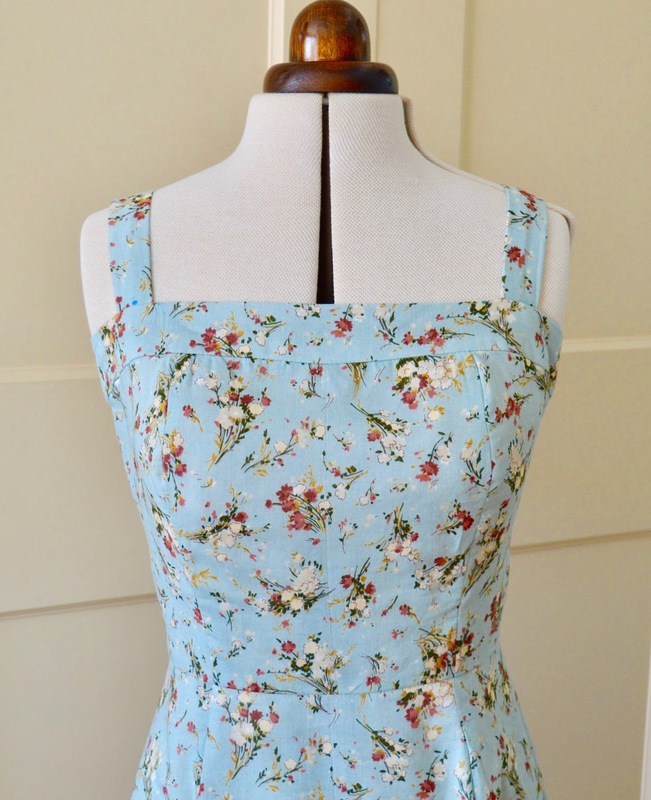 I think the fabric is so summery and gorgeous. Isn't it funny how a small adjustment (that nobody else would notice) can make all the difference between whether or not you will wear the finished garment? Gorgeous dress, I love the fit. Fingers crossed for an unseasonally hot week in October! Great British Sewing Bee Live ticket winners!